I was ask in my previous blog post (storage box), where/how do you store your yarn? Great question. You open the front flap for access to three utility boxes plus on the top the lid opens for bulk storage. One of the utility boxes has several dividers to put all you little notions. 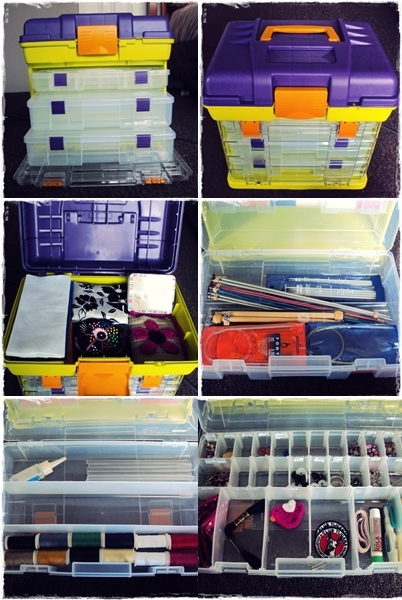 Now I wont have to keep all my crochet and knitting supplies in several different bags. Now that I put my stuff in the storage box it seems like I hardly have anything. :( I guess as the years go on by my stash on hooks, needles and yarn would grow as big as many Ravelers have in their homes. As you can see on the last image I added labels. It can be modify to be as big as you want it. Just add some extra increase rounds. F/O, leave a tail for closing. Add any bits of stuffing needed to finish shaping the egg nicely. Weave tail through the final row and draw up tight to close. Secure and weave in ends. This is real easy to assemble. All you need to do now is cut small squares from white felt and fold them into triangles. Glue them in the egg. Spiny Egg and Mario Brothers are copyright Nintendo.